New York, NY (February 19, 2013) - World renowned British standup comedian Ross Noble stars as a murderous kids' birthday party clown for Director Conor McMahon (Dead Meat, The Disturbed) in Stitches , debuting with special April Fools' Day screenings in select cities on April 1, 2013. For fans who can't catch the rampage on the big screen, Stitches will be available on VOD, Digital Download, Blu-ray(TM), and DVD on April 2 from MPI /Dark Sky Films. Years after a cruel kids' prank during a birthday party for 8-year-old Tommy (Tommy Knight, Doctor Who, The Sarah Jane Adventures) left hired clown Richard "Stitches" Grindle (Ross Noble) dead on the kitchen floor, the childhood friends gather to plan a birthday bash to end all bashes. But they haven't counted on the degenerate jester rising from the grave to seek vengeance on the children who mocked him and caused his grisly, untimely end. Now Tommy and his teenage friends are on the run from an undead jokester who's ready to use every trick in the book (and many that aren't) to exact his revenge. Dead Meat writer-director Conor McMahon delivers a delirious slasher epic, a hilariously twisted and blood-soaked tale of one very bad clown with a talent for making balloon animals - but with one very hideous difference. Red-carpet screenings will be held in New York and Los Angeles to mark the film's release, with star Tommy Knight in attendance. 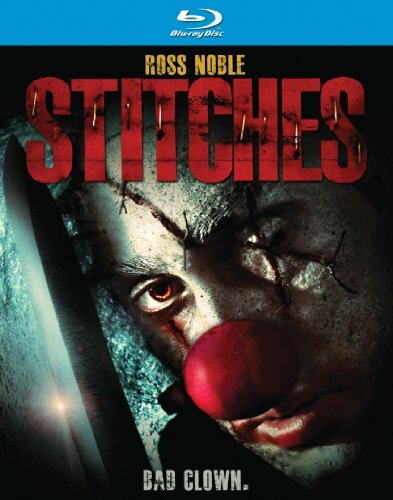 Stitches is an original Dark Sky Films production in partnership with Fantastic Films, Tailored Films and The Irish Film Board. Dark Sky Films is dedicated to the discovery, preservation and production of new and classic horror, sci-fi and cult films from around the world. Based in Chicago, Dark Sky Films is a wholly owned subsidiary of The MPI Media Group - one of the largest independent entertainment companies producing and distributing a compelling slate of the world's most respected cinema, documentaries, performances and television programs.